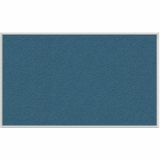 Washable, fabric-backed vinyl tack surface is available in 10 designer colors. Vinyl material retains resiliency so pin holes seem to disappear. Aluminum Frame Tack Boards include hanging hardware. 10-year guarantee.